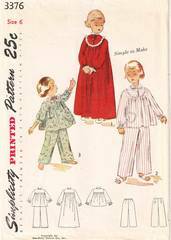 Adorable original vintage Simplicity 3376 sewing pattern from 1950. Child's pajama top and nightgown feature rounded front yoke, straight back yoke and long sleeves gathered by elastic thread. Dainty heart pockets are edge with lace. Trousers have an elastic casing in the back and waistband in front. Child's Size 6, Breast 24, Waist 22, Hip 26. Pattern is complete. Several pieces have been very neatly cut and folded. Pattern pieces and instructions are in excellent condition. Envelope has light age tanning and in complete. Several very neat mends with archival tape. All our vintage sewing patterns are stored in, and shipped with, acid free polypropylene archival sleeves and backing boards. The sleeves are resealable allowing you to use the pattern and then continue to preserve it for future generations.